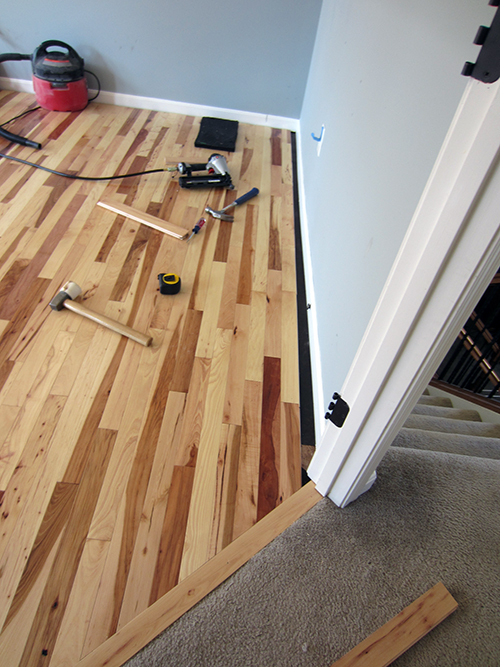 How to install a hardwood floor - Part One - Honey Do This! Just kidding. 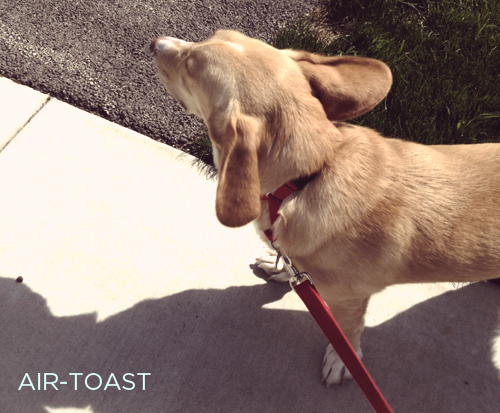 That’s a picture of my dog, french toast. 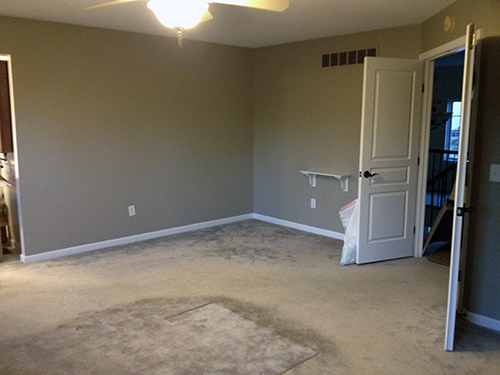 This is the actual room. 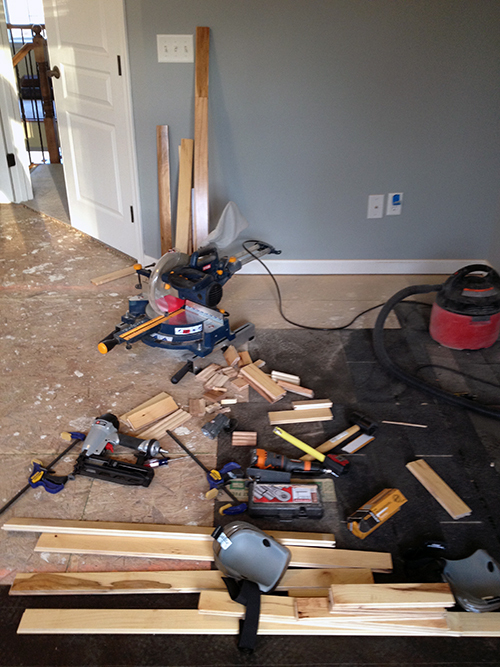 As I was saying…Every project requires specific tools, Daniel-son. Miyagi don’t mess around. Here’s where things get dicey, as there are so many different routes you can take. 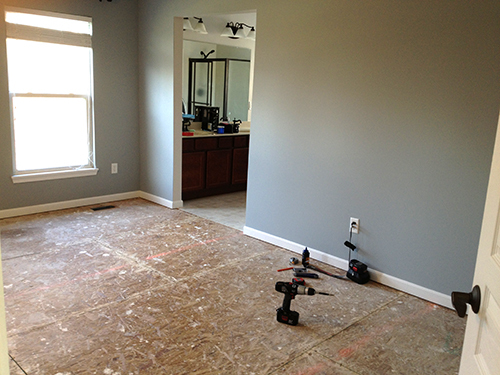 There are electrical, gas powered and pneumatic-based staple and nail guns. 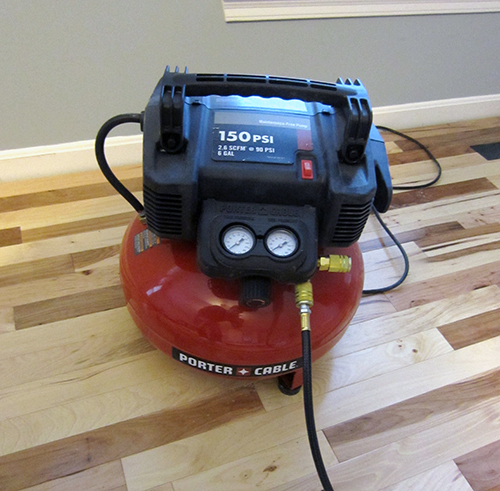 I’ve used my dad’s gas-cartridge nailer which was nice, but the pneumatic nailer is where it’s at. It requires an air compressor and a hose. 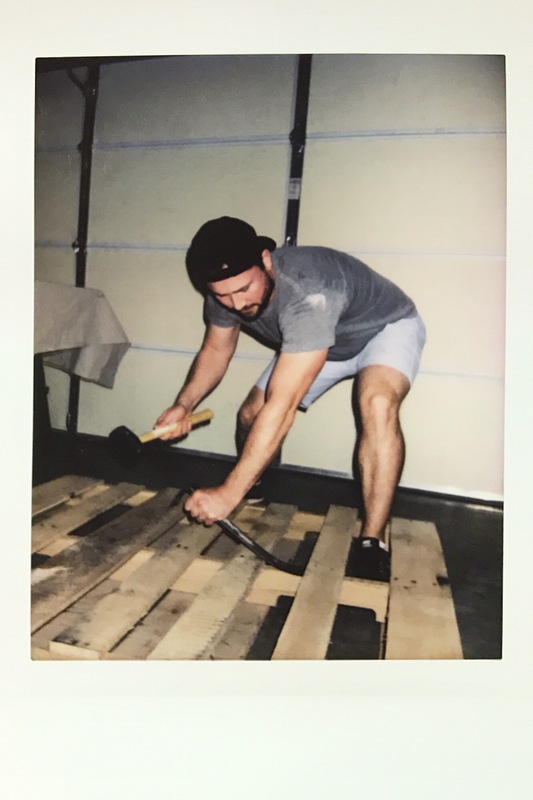 My parents sent me a Porter Cable Combo Kit that included an air compressor, finish nailer, brad nailer and staple gun. I think it’s a steal. They also sent the work-horse, NuMax 3-in-1 big-daddy-hamma-time-naila . What did I do to deserve these gifts? (NOTHING!) The only catch is that in order to use them, I have to work…really hard! So I would say if you’ve got something already, go with it. 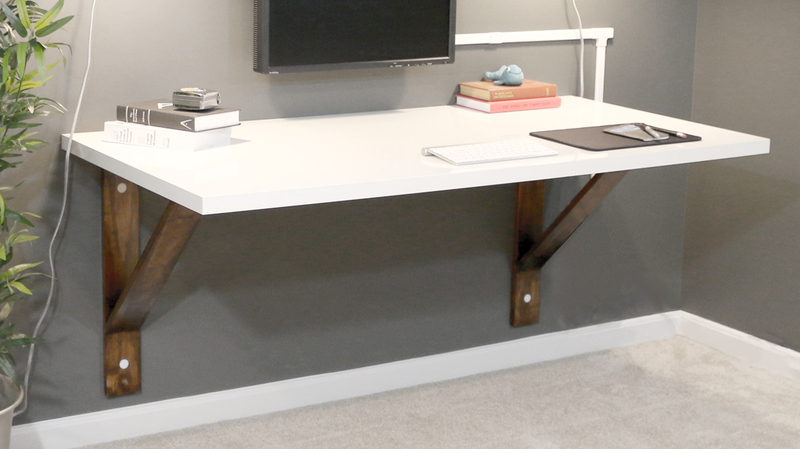 If you want to make your life easier, get a hamma-time for yourself. 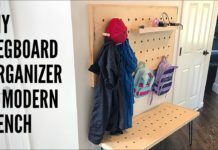 On the edges of the room you’re going to need a finish nailer like in this combo kit, or you can always pre-drill and do it manually with some brads. But c’mon, it’s 2013. Who’s got the patience for that?! Do I really need these? 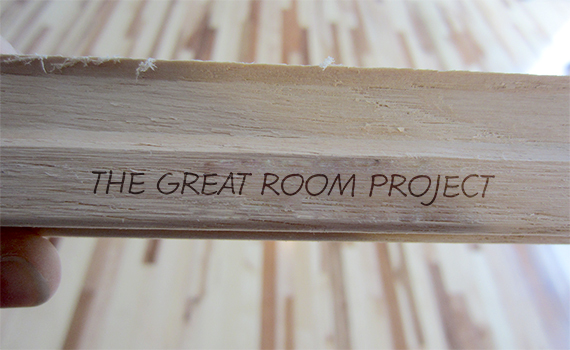 Well, you may have to make very specific cuts into certain boards for varying reasons, such as details around a doorway threshold (Jig-Saw) or the last piece on the far side of the room (Table/Circular Saws). 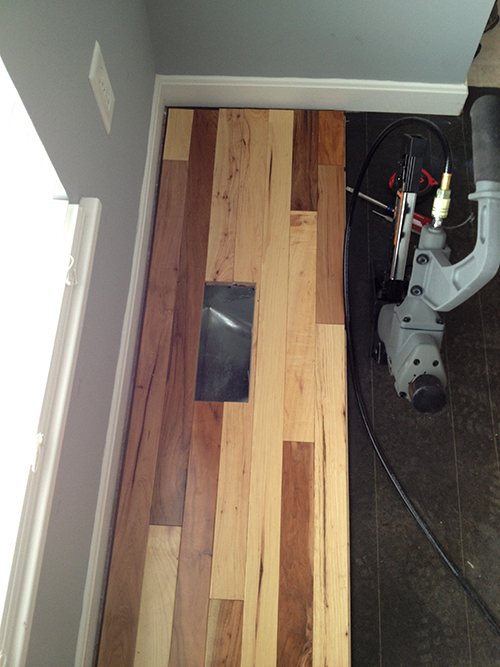 Additionally, I used my Ridgid JobMax Multi-Tool with varying attachments to properly cut the door trim so that the hardwood looks seamless. So again, do you really need this? No. But it made my life much less terrible than it could have been. Do YOU want a terrible life? Now we’re on to materials, products and all that stuff no one thinks about. 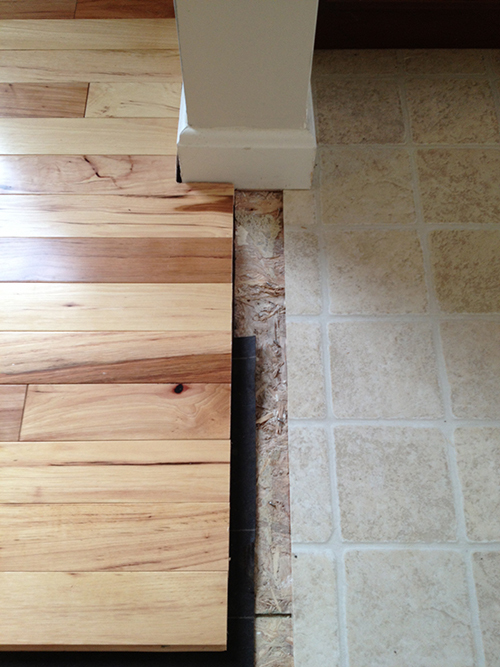 Note that these are not solutions for putting hardwood on concrete, wet or anything other than 3/4″ MDF sub-floor. 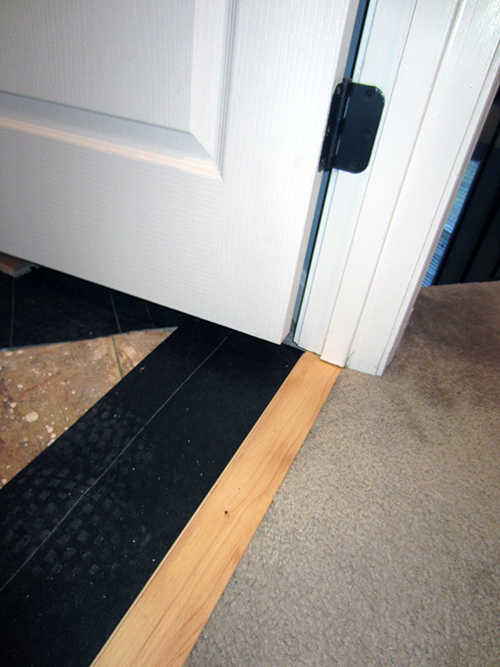 Obviously if your sub floor is thicker/thinner you can adjust as needed, but for specific conditions…keep researching! Ask your local bowling alley owner or something. 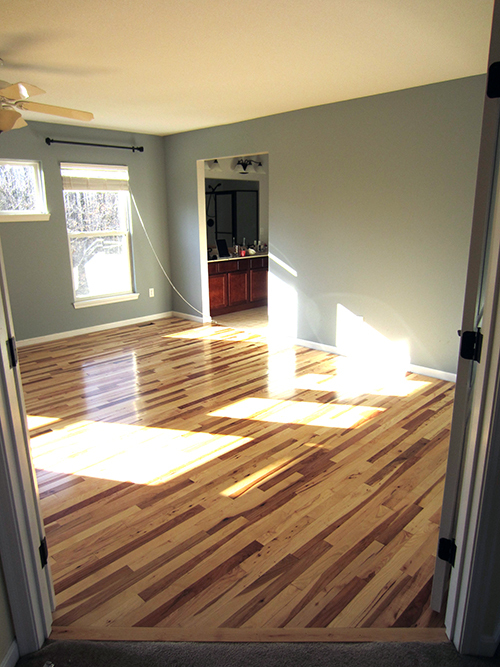 2″ Decking Screws: Squeaky sub-floor got you down? 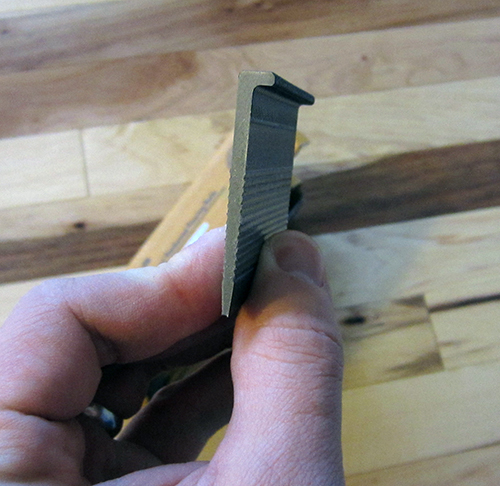 For a limited time offer these decking screws will hold that floor down! 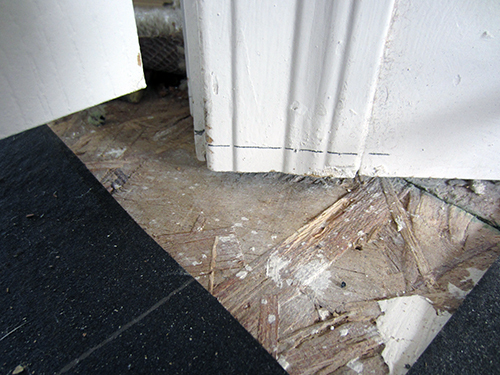 Roofing Shingles (the cheapest you can find): Uneven sub-floor ruining your marriage? 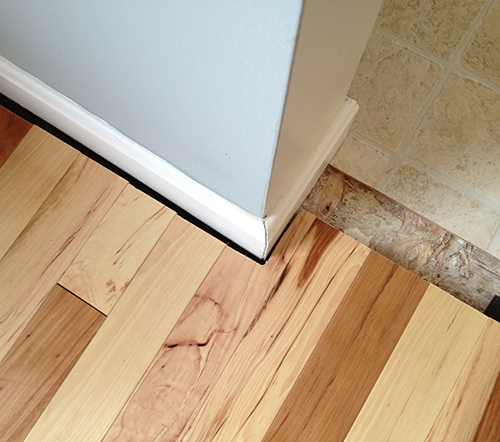 Is there more than a 3/8″ gap over a 6ft span? “Feather” out these shingles across your low-lying sub-floor and watch your marriage’s ebs turn to FLOWS baby! Staple down if needed. 30lb Roofing Felt: Next to the the shingles at home depot/lowes. You can’t miss it, they’re in rolls that say, “30LB ROOFING FELT”! If your low spots aren’t that low and you only need a little filler, grab this stuff and “feather” it out. 15lb Roofing Felt/Rosin Paper: I couldn’t locate the rosin paper. But truth be told, I didn’t look very hard. It’s actually in the near the paint aisle in home depot, by the tarps and body bags. I’m fairly sure you get less bang for your buck on this, which is why I went with 15lb roofing felt instead! It’s cheap and dirty, but seals off the sub-floor like woa. 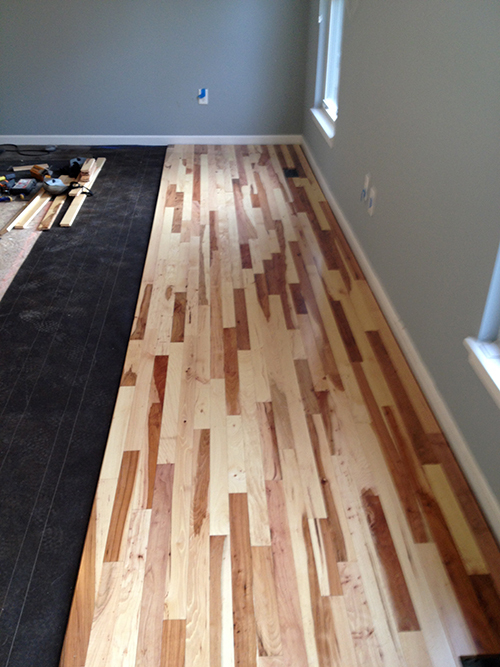 Yo, don’t forget your hardwood! 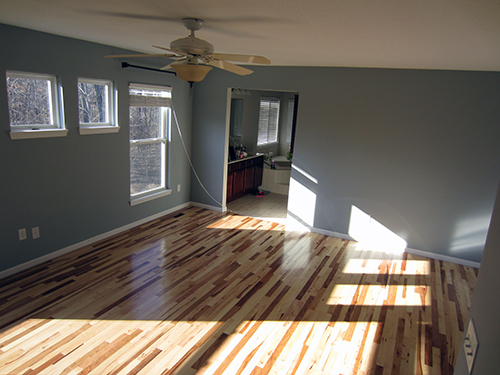 In November after eye-sight-ruining amounts of online research, I can declare that lumber liquidators is the cheapest place to get hardwood. They had a sale on top of a sale with side of promo code. 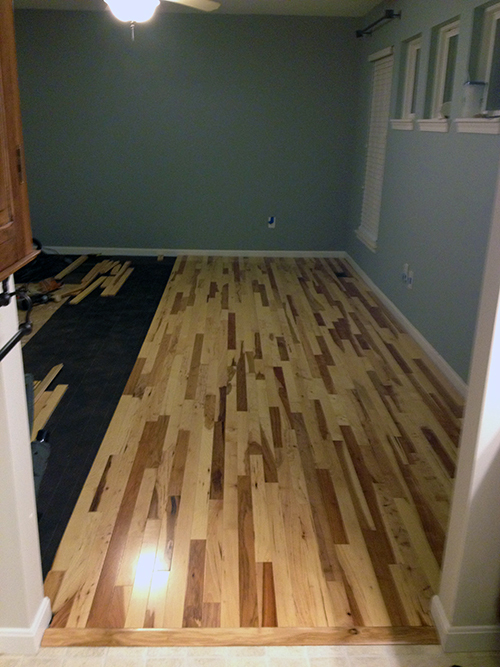 I ended up getting Builder’s Pride 2-1/4″ wide, 3/4″ thick Hickory Hardwood. I ordered more than 1000 sq. ft., so they knocked the price per sq. ft. down even more. Good lawd what a steal. I ordered 60 boxes (after measuring my total sq. footage) and after being on back-order for a few weeks my shipment finally arrived. Now what? Well, delivery was equal to the amount I paid for 3/4 of the order. So uh…screw that. I’ll carry that wood home. LL Manager: Are you installing this yourself? LL Manager: Do you know what you’re doing? LL Manager: Ha. Do you have somebody helping you? Me: Will you help me install it? Me: Well, I guess I’m on my own. When the lumber store guys says you’ve got a lot of wood, you know you’re doing it right. I rented home depot’s steak-body-type ford 350 pick-up truck. It took me two trips (two big pallets of wood) and I was blasting Christmas music the whole way (sorry person who rented the truck after me). I think it was 100 bucks for the day with gas. Unloading from the truck into the house was the hardest part. The boxes are extremely heavy and 8ft long…so I needed Rachel’s help. She rose to the challenge and we both were sore the next day. If you’ve got a truck, you’re in good shape. If not, I’d find a friend or if you must…rent one. 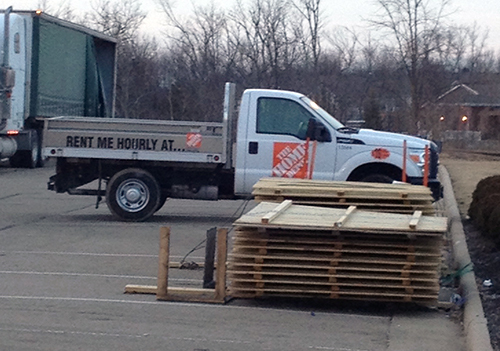 The nice thing about Home Depot’s truck is that the sides came down for easy loading/unloading. L Cleats, T Cleats or Staples? 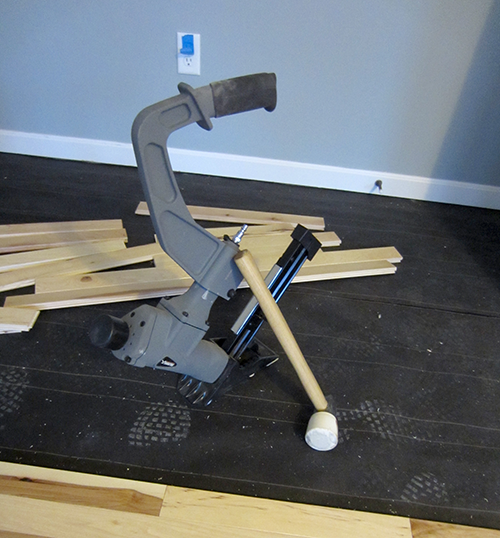 Well, I’m not a professional floor layer guy…but I used Bostitch 2″ L Cleats with my 3-in-1 Hamma-Time-Floor-Naila . Here’s a little write-up on the differences in flooring fasteners that I dug up during my archeological-floor-laying research. 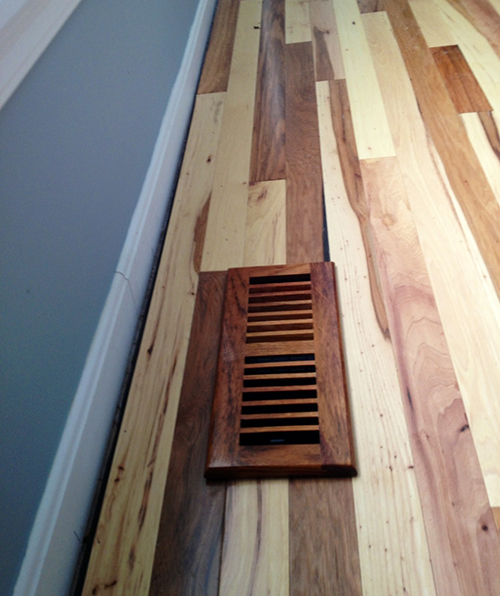 Quarter-Round: I stumbled upon a thread where there was a side-discussion about using quarter-round when laying hardwood. Interestingly enough, geographic location plays a significant role in whether or not quarter-round-usage is “the norm”. In the northeast, where I was created, that’s what people do. 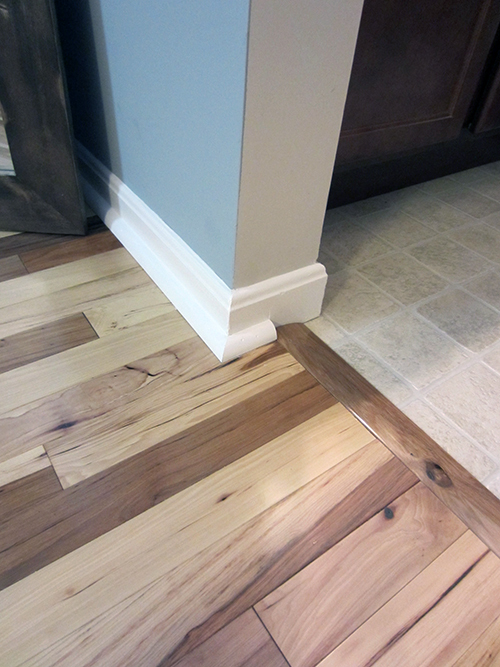 In the mid-west, they place the baseboard on top of the hardwood. Well, we’re not around Chicago anymore, and Ohio is border-line mid-west in my unprofessional opinion…so I think I can slide with the quarter-round, though I’d like to talk about this more sometime. Maybe over coffee? What’s normal for your area? It’s a date. Yea sure, bring your kids. BOOM! 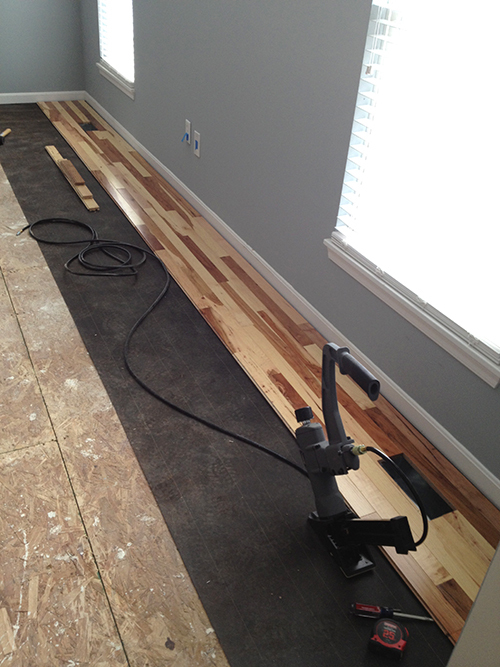 That’s your mind exploding with hardwood-floor laying knowledge! Let’s do stuff with it! 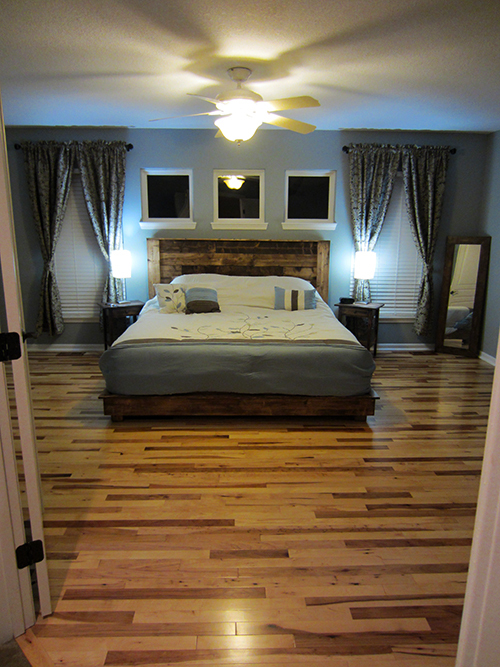 For as long as we’ve owned a house, I’ve always wanted hardwood floors in our master bedroom. Why? 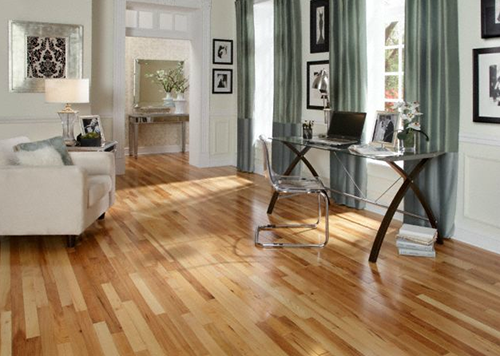 Because I like hardwood. 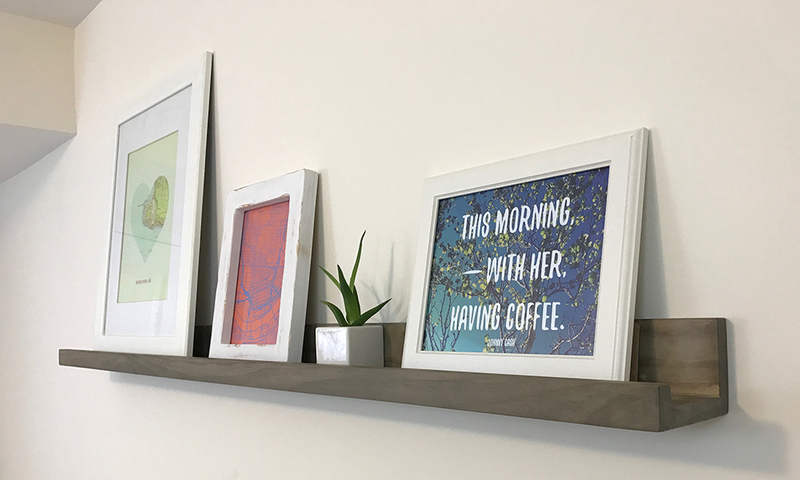 (duh) It makes everything in the room look better. 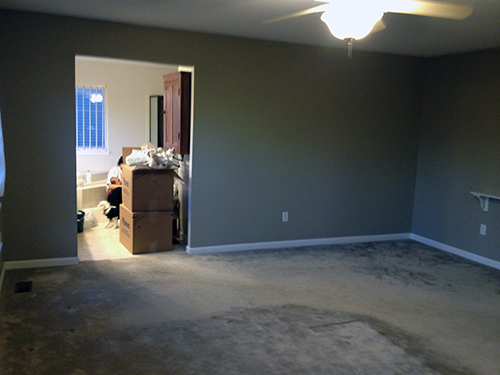 So, with our most recent move to the Cincinnati area, I’m DOING IT! 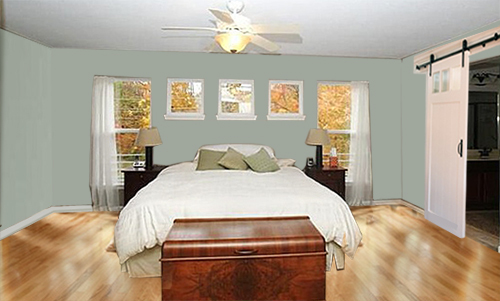 Back in November I mocked-up an image of how I’d like the bedroom to look. 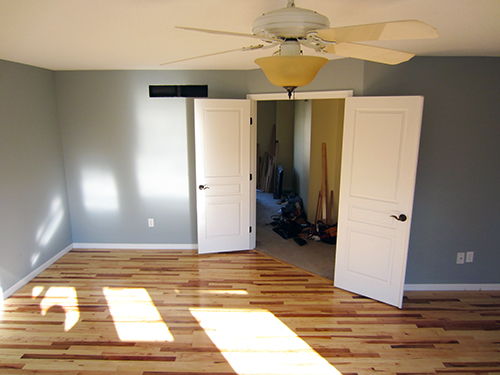 I wanted a light greyish green or blue wall color, hickory hardwood floors and some sort of large sliding barn door(s). 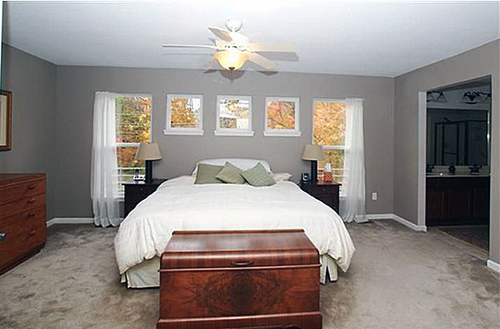 I hope to re-use the curtains, platform bedframe and headboard along with the re-finished ikea nightstands (assuming they go with the hickory) from our previous house. Let’s get started. The carpet looked much nicer in the MLS photo. It’s pretty gross and I’m fairly certain the previous owner had cats. Besides the fact that I HATE CATS, I don’t have anything against cats. 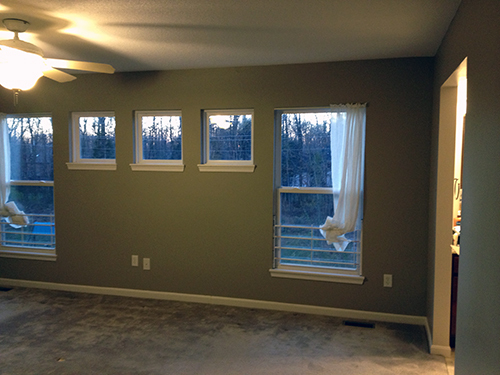 Fun fact: All of the 2nd floor windows in our house have burglar bars or “child-safety” bars. At first we were taken aback, is this a prison?! But after learning the former owners had a child with special needs, it makes much more sense. From the back exterior wall. Yucky carpet. 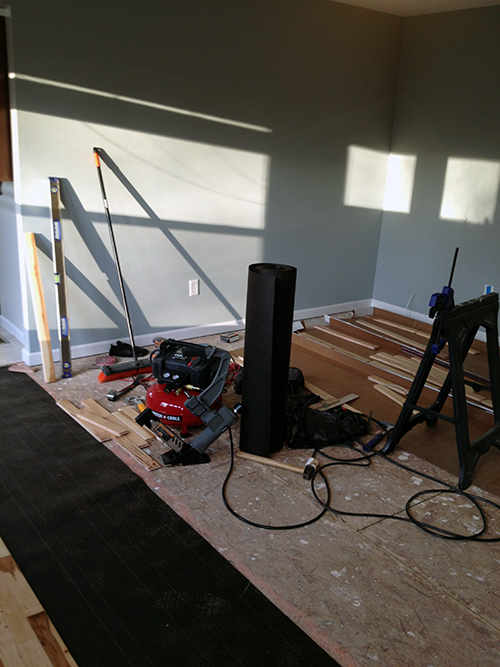 I took an Ofla blade (utility knife) and cut long-ways with the room every 4.5 feet or so. 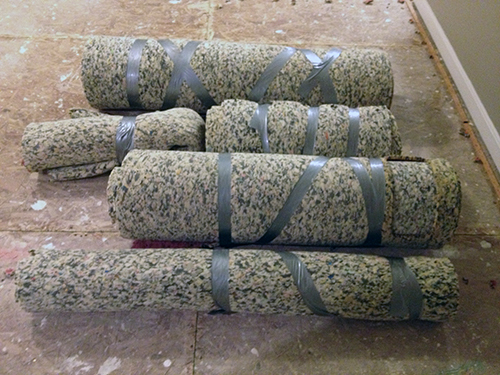 After that I rolled the carpet and pad up, taped them up and thew ’em out! Wear gloves if you plan on doing this! Knee pads wouldn’t hurt either. I found that the duct-tape held better on the padding when I went from left to right diagonally, rather than trying to wrap it around vertically a couple of times. But first I swept and ran the shop vac. 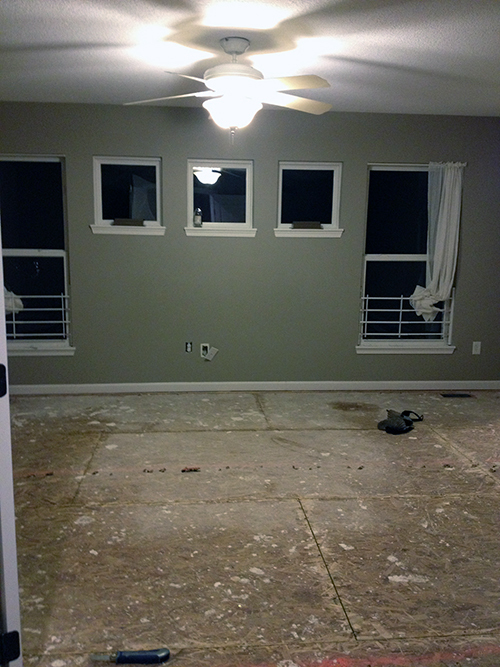 Using a crowbar, gloves and knee-pads, I pulled out every single carpet staple. Don’t try and do this with pliers, the crowbar works much better and faster. I only used pliers for the staples that fought back. Finally I brought up the perimeter carpet tack and any staples I missed. 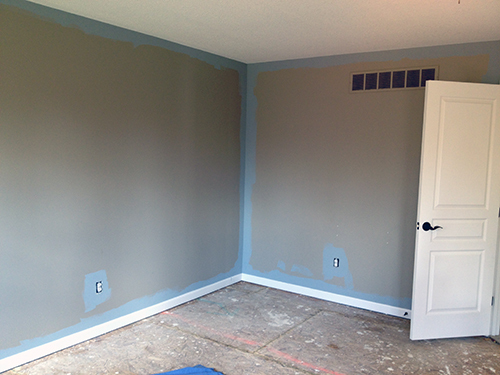 I went with a zero VOC olympic blue/grey flat paint and started cutting-in. 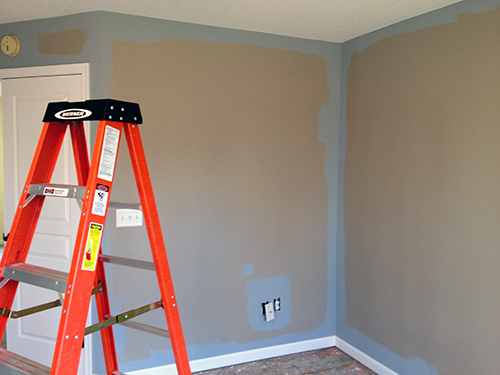 This paint has really nice coverage. Ok, here’s where things get interesting. 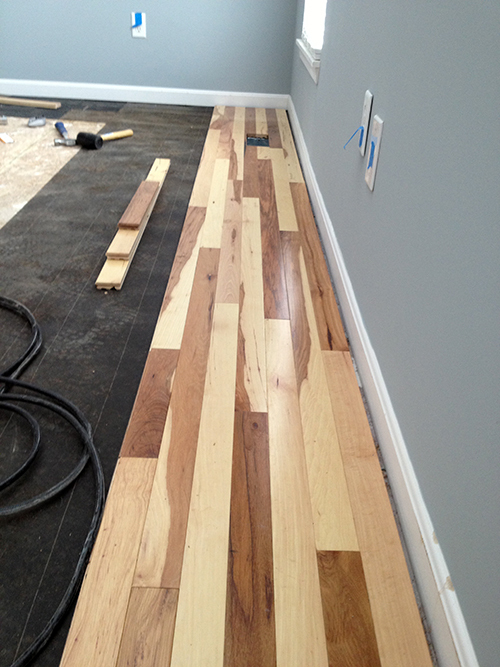 In order to (properly) lay hardwood, it’s important that the subfloor (3/4″ mdf pictured above) is FLAT. 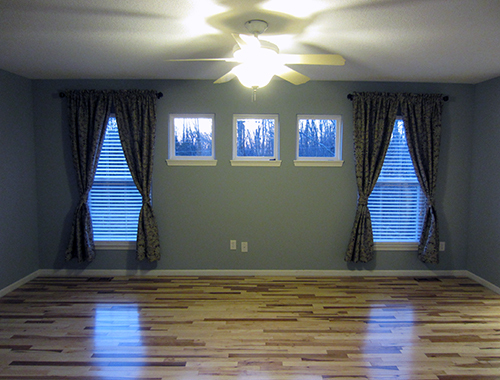 After extensive reading, I learned that it’s not so much that the floor has to be level, as it has to be flat. 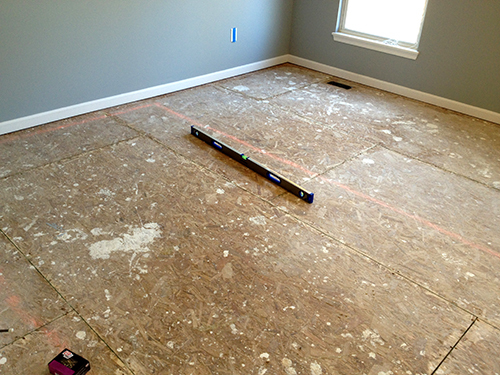 So to determine if your subfloor is flat, take a 5-8ft level and tape measure and go around the room and see if there’s any high/low spots. 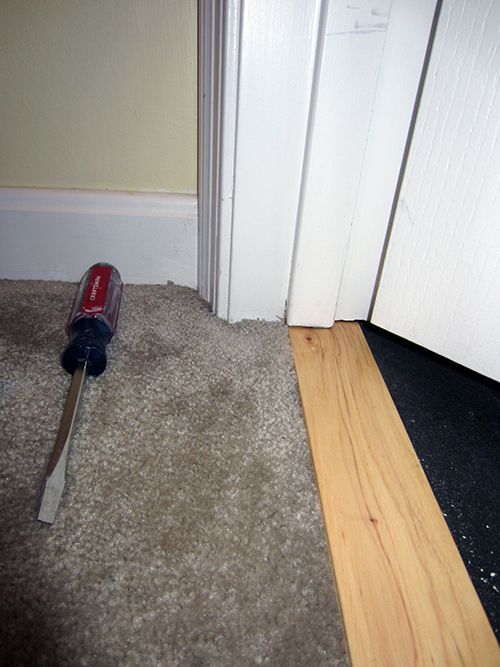 You want to make sure any gaps are LESS THAN 3/8″. 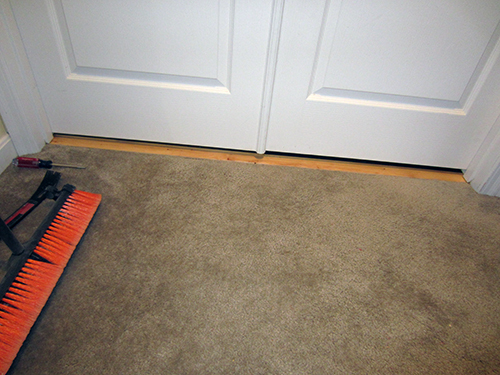 This will eliminate any problems down the line with bowing, warping, squeaking, cracking, crying, complaining, etc. And an extremely low spot to the left of the level. You can’t always see this stuff with the naked-eye, but it’s important to take your time and be meticulous. Protect that investment! 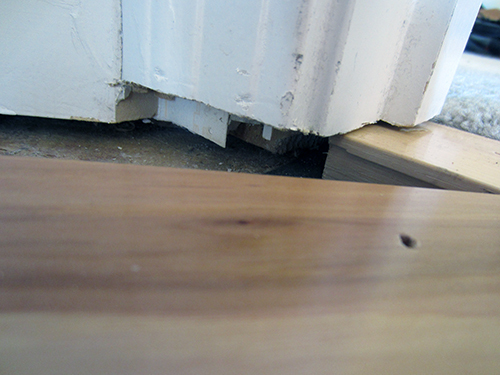 I also picked up decking screws and screwed any squeaky boards into the joist. You can usually locate where the joists are easily because the builder screwed the hell out of the mdf in clusters throughout the room. So how to you get those low spots on par? Well, the internet told me to use roofing shingles and 30lb roofing felt. 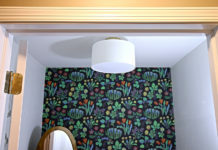 The idea is you “feather out” the low spot over 6-8ft area so that visually you’ll never be able to tell the difference. I picked up a pack of shingles only to find out they were WET, thanks home depot. I let them get dry out at room temperature After I was positive they were 100% good to go, I feathered out my low spots. El diablo. 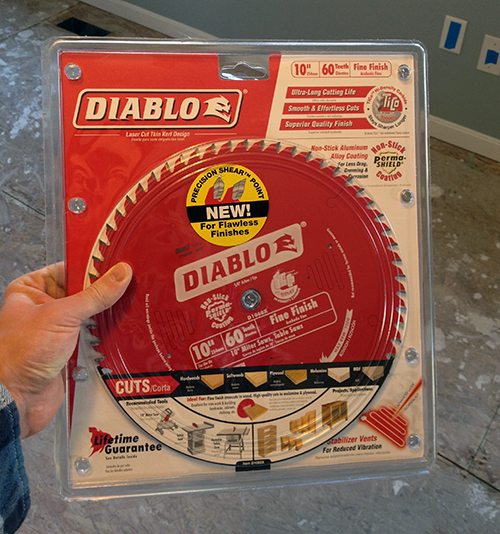 For my miter saw…Up until this point I’ve been using the blade that came with the saw. 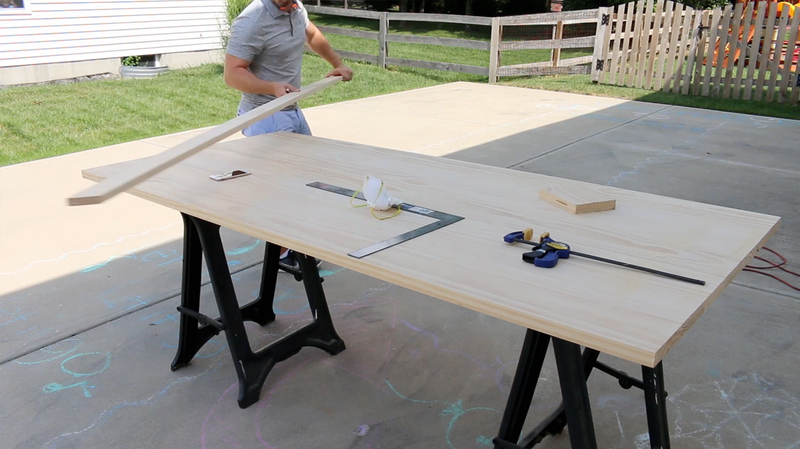 This guy is for super-fine cuts of hardwood. Supafine. 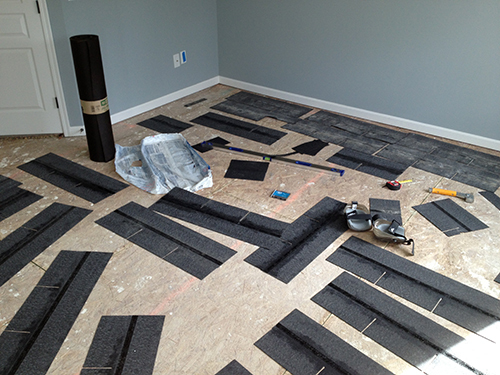 I laid out 15lb roofing felt, cut it to the length of the room and sparingly stapled it down with a staple gun. 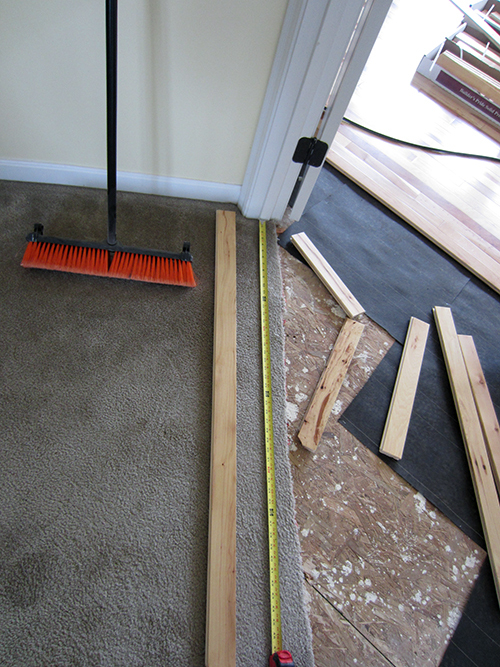 Next I Measured out the width of my planks (2-1/2″) PLUS my desired expansion gap (1/2″ as per the manufacturer’s reco). That’s 3″. I made three marks at both ends of the wall and the center. Next I took my chalk line, lined it up with my marks and SNAP! I’ve got a blue mark where the tongue of my first row will be. 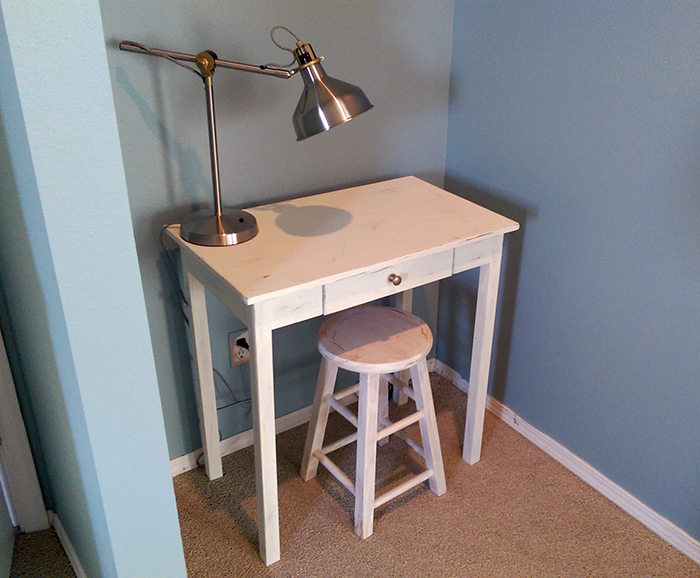 To secure the first row, I used a 16 gauge finish nailer with 2″ nails. I nailed straight down on the wall side of the planks (as close as I could get to the wall) and diagonally into the tongue. 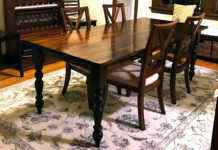 It’s important to choose the longest, straightest pieces available for the first row. I’ll be using quarter-round to cover the gap. 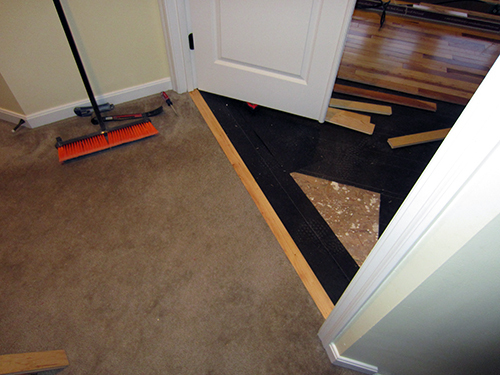 I cut into the bathroom linoleum to make room for the hickory reducer that will smooth out the transition. I used a jigsaw to notch out the piece that runs into the wall. 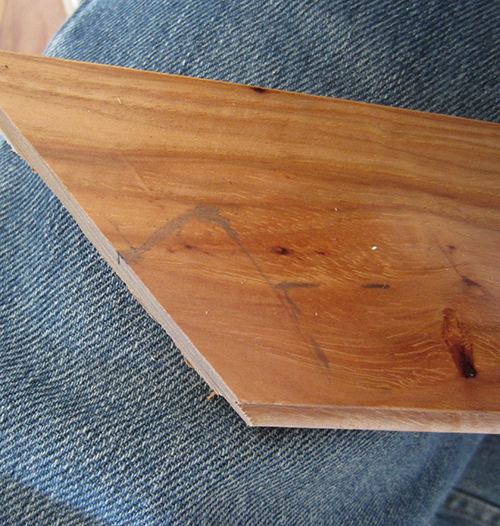 I do my best to vary the pieces in length and tone while also focusing on staggering the joints. 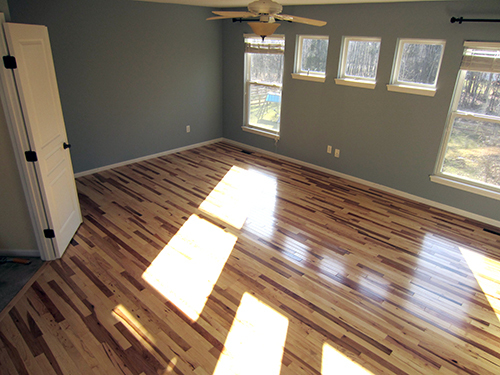 When calculating how much hardwood product you need, the manufacturer suggests adding a 10% waste factor to your room’s square footage. Those planks leaning against the wall are my waste after 4-1/2 boxes. Well under 10%. So far so good. It’s much easier to work during daylight. The sun is starting to set here and my back is screaming. The constant ups and downs from laying out the next row to getting up and stapling is making me feel…OLD! Check back soon, as I should have this done in time for valentines day (yea right)…presidents’ day? NOPE! Here’s an update with the reducer in. Looking good! 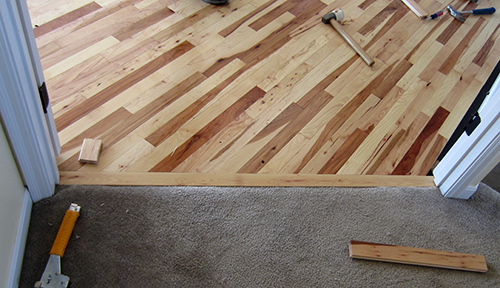 It’s important when installing hardwood floors not to hit your fingers with a hammer. For me, when this kind of thing starts to happen, it’s usually a sign that it’s time to call it quits for the day. Or maybe I’ll just go shopping. I picked up two “cherry” grills from the home depot for 18 bucks each. 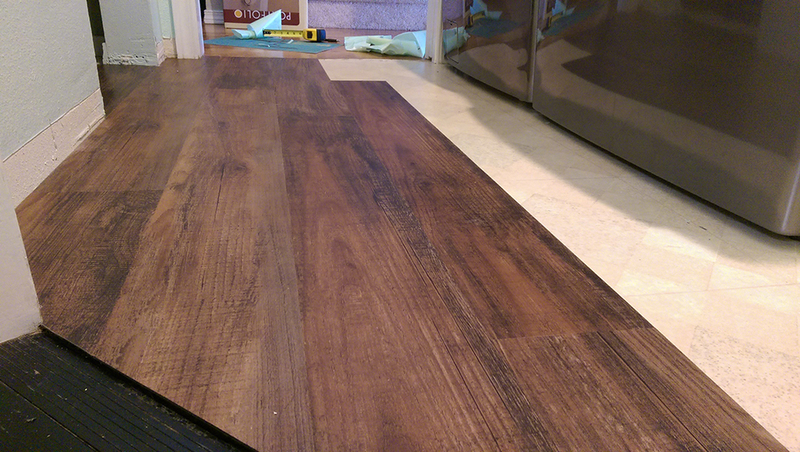 They matched some of the darker planks and were about $15 cheaper than anything available at lumber liquidators. 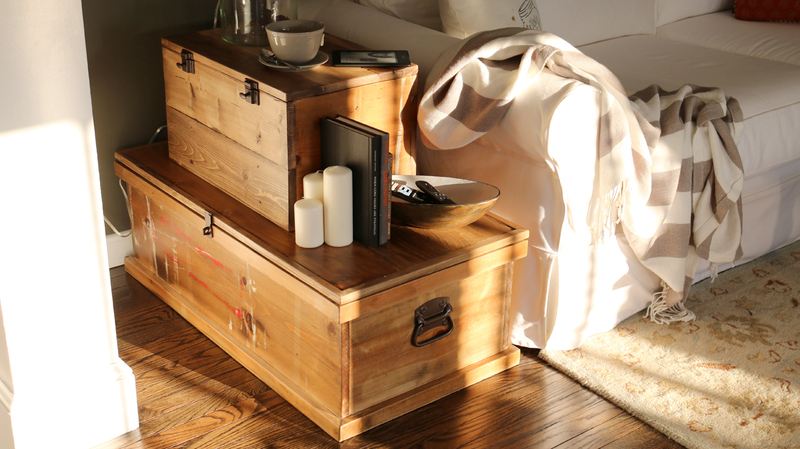 There were pine and oak finishes available as well, but the oak grain didn’t match the hickory’s and the pine’s tone was way off. As I get closer and closer to the far wall, I realize that this threshold isn’t going to complete itself. 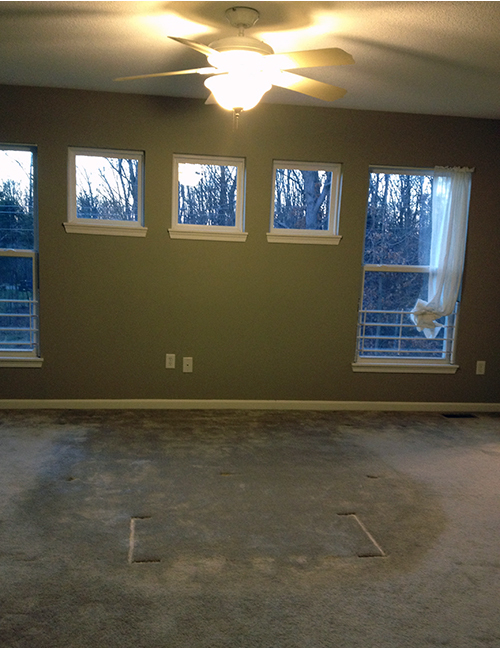 First I cut the carpet and padding back, leaving about 1/8″ hangover (of carpet, not padding) where I want my plank to go. 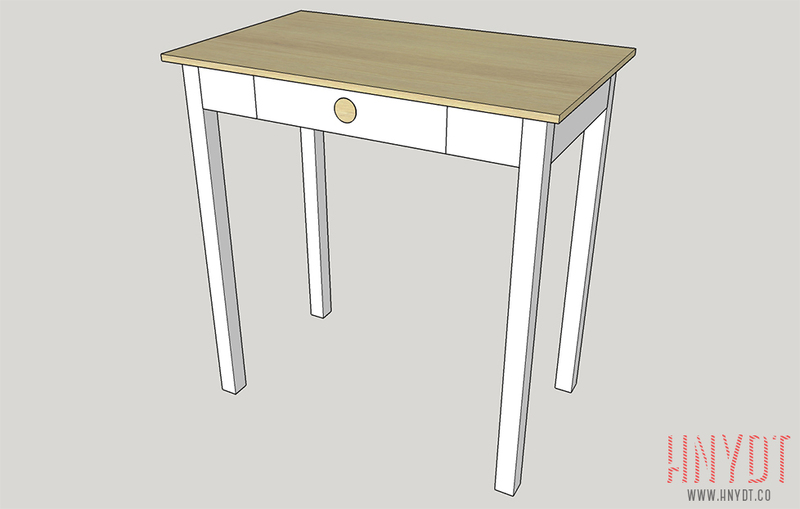 After that I measure the distance from jamb to jamb to determine how long my piece needs to be. 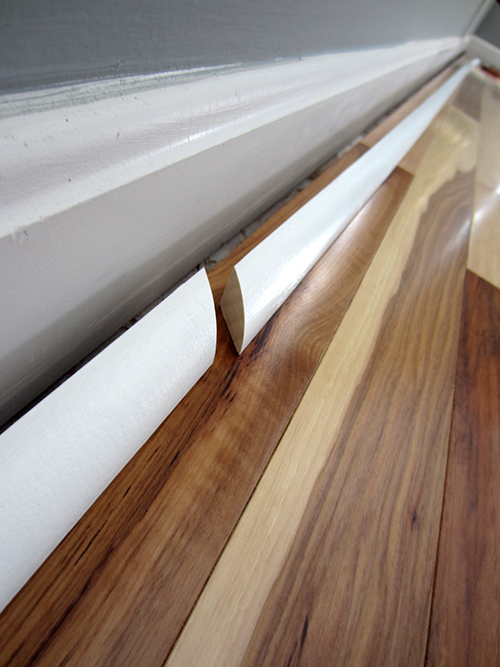 I’ll add 1/2″ or so on each side so it will slide under the trim and appear to be seamless. Magicians never reveal their tricks? HOGWASH! 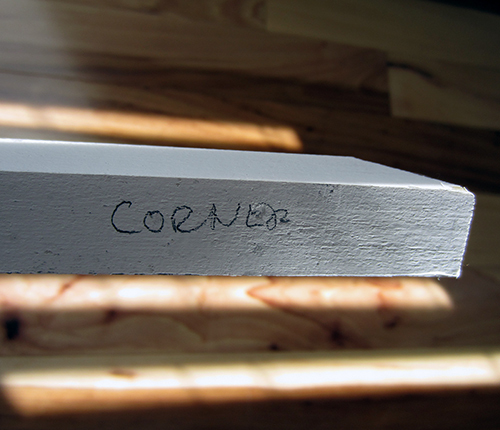 I take a scrap piece and draw a mark onto the trim. 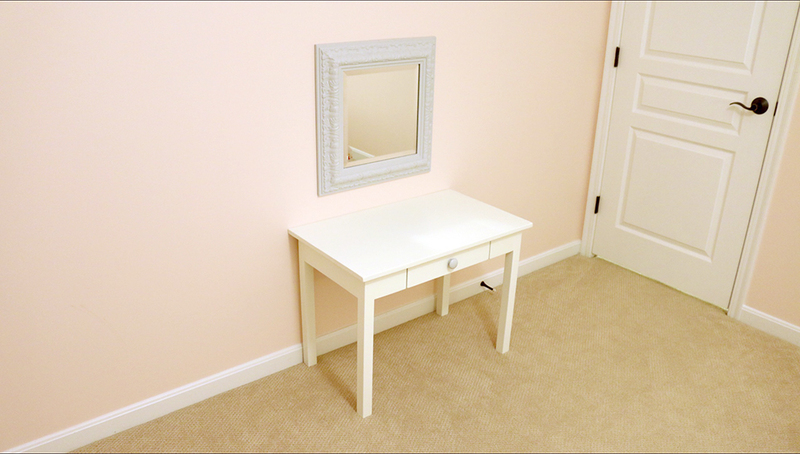 This is where I’m going to cut the trim and slide my piece under. Quarter-round can’t go in front of the trim. It won’t be flush and it will look terrible. Nobody likes terrible things! We went over this earlier! Using my Ridgid JobMax Multi-Tool with the semi circular attachment, I carefully cut on my mark. 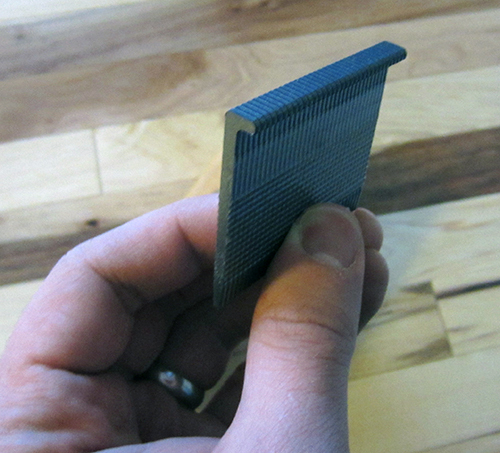 It’s a good idea to slide the piece in and make sure it fits properly before face-nailing it down. Or you could ignore this advice and mess up your entire bedroom. Your call! 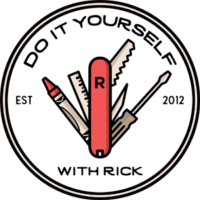 Next I’m going to rip(cut, rip means cut) (rip means to cut parallel to the grain…thanks neuromonkey) off the tongue and bottom groove on the carpet side with my dad’s table-saw. 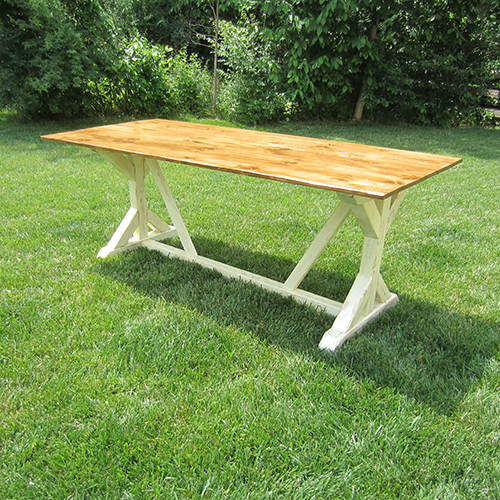 This can be done with a circular saw if you don’t have an opportunity to borrow my dad’s table saw! 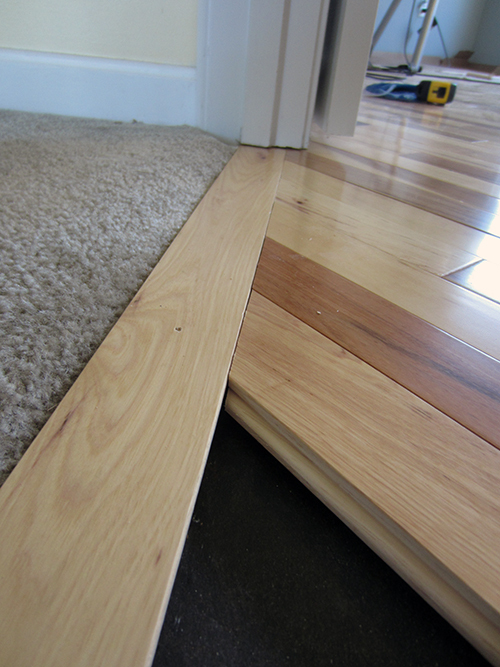 The 1/8″ piece of carpet that I left will slide right under the top groove. In theory. 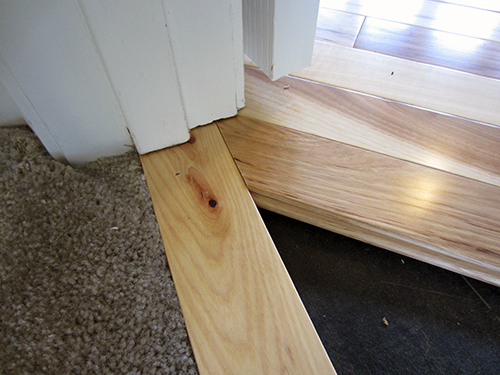 Is this the correct way to do a threshold? I have no idea. But it looks pretty good to me. Too late now, anyway! Comment below if there’s a better way, now I’m curious! My parents came to visit and dad was a huge help. What we did in half an afternoon what would have taken me…days! There are tools to calculate the angle this board is set at…but I haven’t had a protractor since 10th grade geometry. And I don’t plan on it Ms. Anderson! So through trial, error and my miter saw we arrived at 44 degrees. She’s probably married now, Mrs. Anderson. 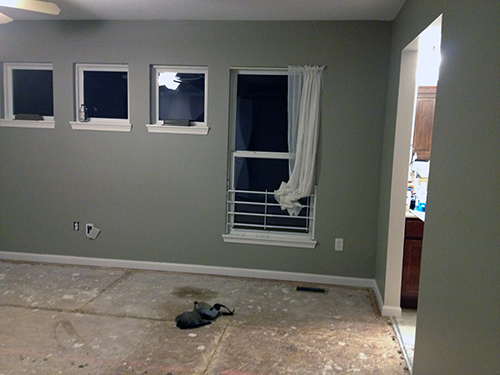 After the threshold was in, the remaining pieces went in fairly easily. The hamma-time-naila won’t work for the last 3 rows, so we face nailed them. Later we’ll cover up the nail holes with some filla. Wood filla. Here’s my dad measuring the last row’s first piece. It was a little tricky with part of the piece going under the trim, then getting thinner to accommodate the expansion gap. Here’s the cut mark. Kinda TRICKY, right?! It’s hard to tell, I know. So while he does the tricky cut, I’m taking pictures. Typical! Once we got the last row in, we were finished! 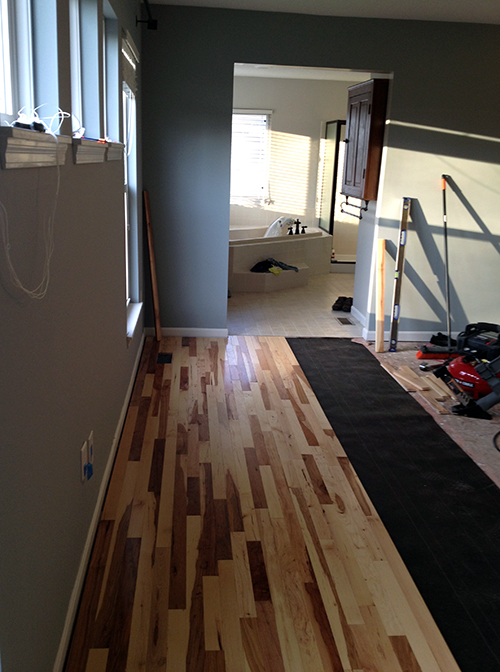 I put all the tools away, swept, shop-vac’d, regular vac’d and risky business’d in my socks. Looks so good. I can’t believe it’s finally finished. 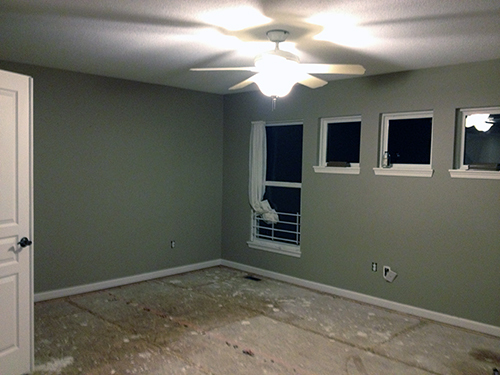 Tomorrow I’ll be touching up the paint in the spots where I hit the wall with hammers, wood, my elbow and screw drivers! Things got out of hand one night. 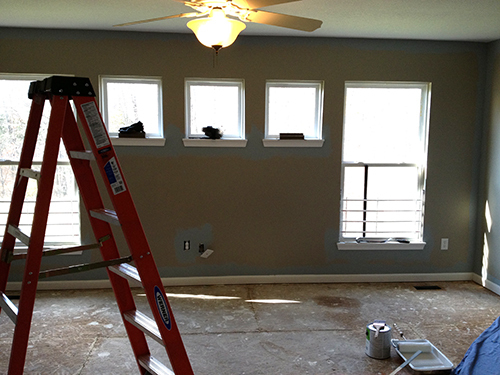 With the help of my pops we’ll be filling in some of the face-nail holes and installing quarter-round. I’ll sign off tonight with this! Just kidding, now I’m signing off. There’s no sign off button or anything, it just means I’m leaving. Oh, before I forget. Drop me a comment below, let me know what you think or would do differently. And just so you know, critics everywhere are are raving about this post. My dad and I picked up nine 8′ pieces of quarter-round from home depot. If he had his truck with him, we would probably grab longer lengths and save some money. Anyway, these were $3.69 a pop. 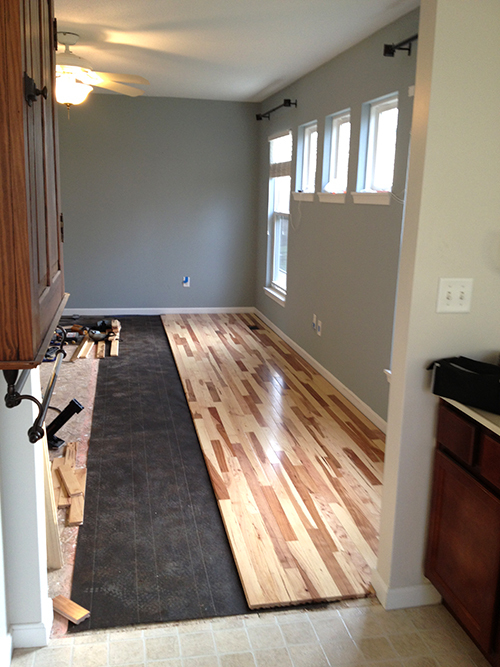 Using a square, miter saw and finish nailer (with 2″ 16 gauge nails) we got going on the installation. 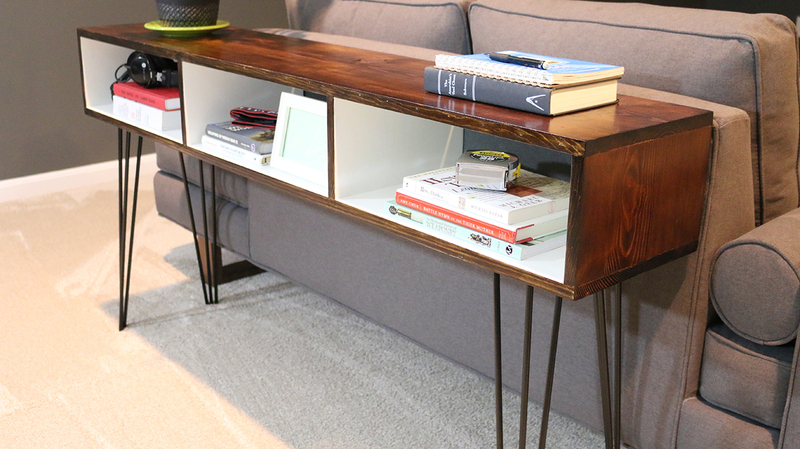 Here’s an easy way to keep track of which piece goes where. We did one corner at a time, as to not confuse ourselves. 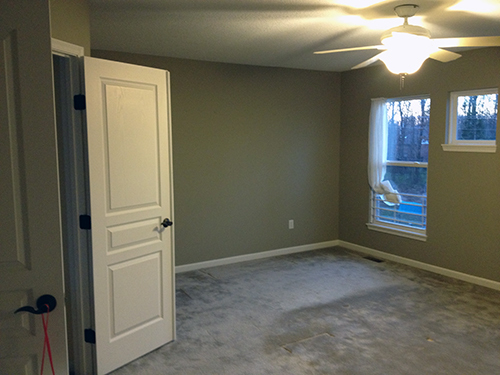 Since the walls weren’t perfectly square, we had to mess with the angles a little bit here and there. 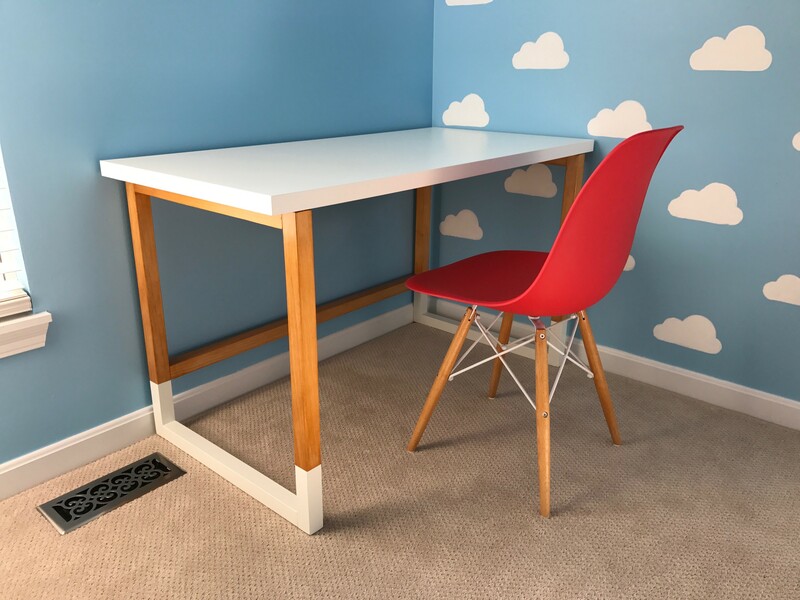 The good news is we’re going to use paint-able white caulk (the “paint-able in 30-minute kind) to fill any gaps and holes left from the finish-nailer. Cut joining pieces at a 45 to be like the pros. Nail, then caulk that sucka. 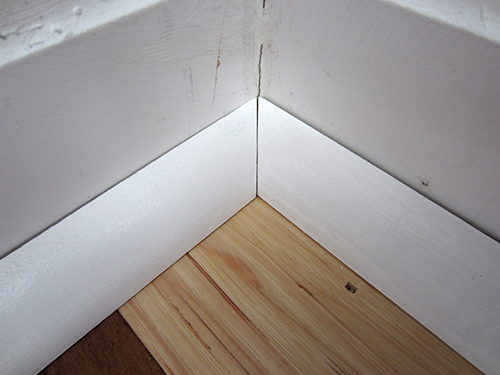 Here’s the corner after the caulk + semi-gloss pure white. I don’t enjoy painting, by the way. It’s on my top-ten worst things to do list. Nice, clean transition. Dear old dad knows his stuff. 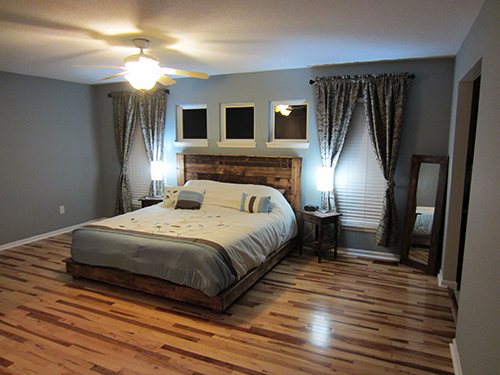 I quickly grabbed the headboard, mounted it and threw in the platform bed. Within SECONDS it looked like this. 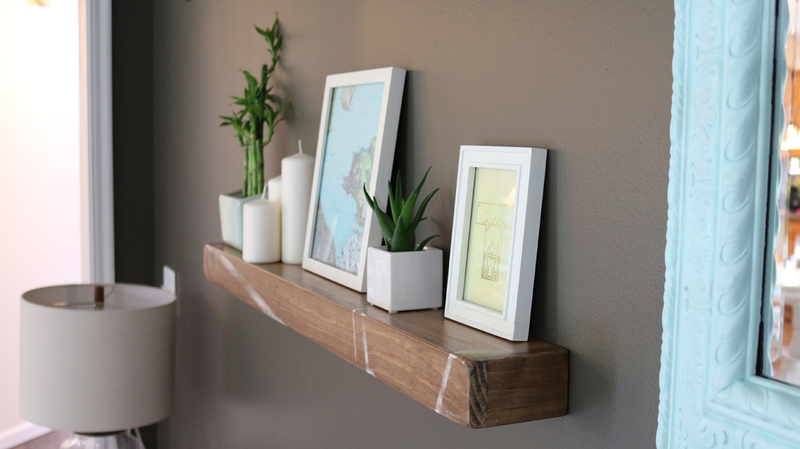 Thanks for all of the feedback below and from the reddit DIY community! Looks awesome! 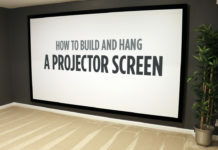 You should have your own tv show. Thanks Ker! It’s all downhill from here. A show would be hilarious. It wouldn’t take long before the producers realize I have no idea what I’m doing. Thank you! What’s really great is in person you can see all of the mistakes I’ve made! I see what you did there! haha. Thanks for taking the time to stop by, read and comment! Much appreciated. I have a couple of questions. 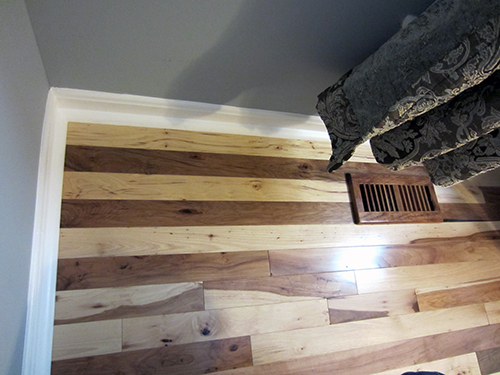 I pulled up the vinyl stick-on square flooring, glued and screwed plywood, and ultimately the interesting mix of 2 separate sections of hardwood red oak of two different widths that previous owners used for the repair job from a leak near the tub sinceI didn’t really care for a floor that was growing increasingly mushy. 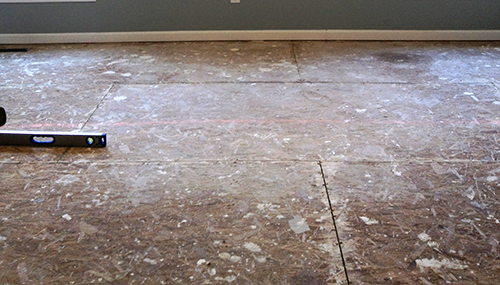 I’ve replaced a couple of the pine subfloor planks that seemed to be rotting but I am left with a couple of places where the subfloor plank edges are not “flat” or even in height. 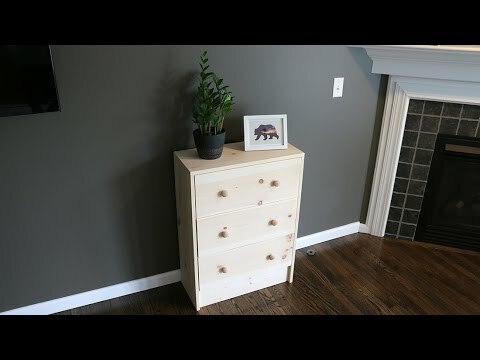 As one DIYer to another, don’t you think I can sand the higher edges a bit as long as the original difference in height isn’t more than the 3/8″ you were talking about? Also, I’m planning to lay 30lb roofing felt over the whole shebang then 1/4″ plywood just to make sure things are evened out before I lay the 150 year old reclaimed chestnut planks from an old barn that will become my new floor. 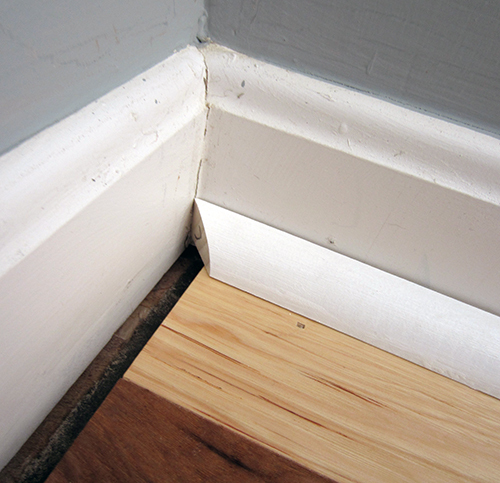 I’m a little bit concerned about the expansion gap space I know I need because under the tub and under some of the walls/baseboards/vanity and above floor closet that were all installed on top of the old hardwoods, it has been difficult to cut the previous hardwoods flush, much less undercut them beneath some of the above. 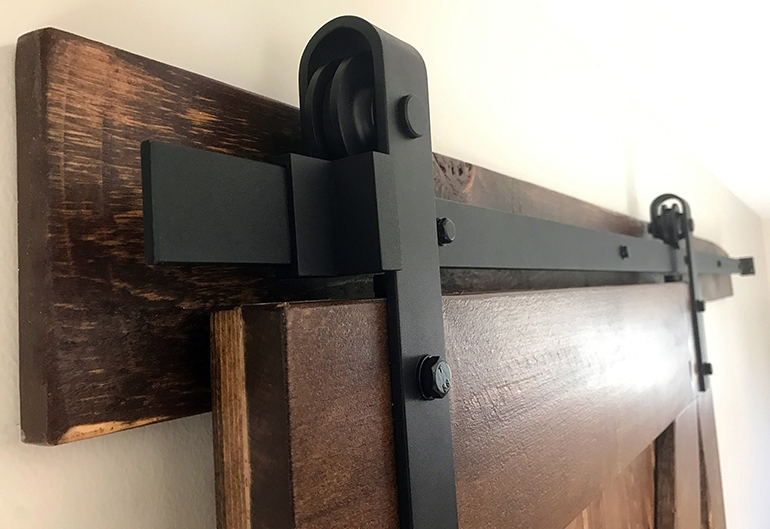 You mentioned “It was a little tricky with part of the piece going under the trim, then getting thinner to accommodate the expansion gap.” What do you mean about the getting thinner to accommodate the expansion gap part? Did you cut the side against the wall at an angle? Thanks for any words of wisdom. Like you, I have researched online taking the useful pieces of info and trying to put them together to fit my scenario. Thanks for posting your adventure. 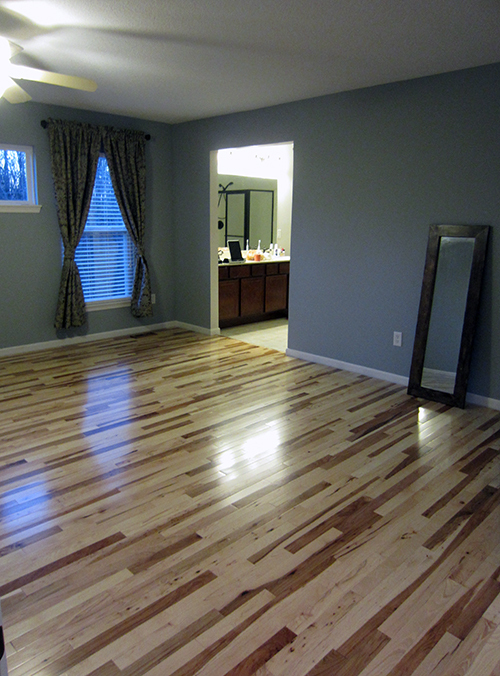 Your floor is gorgeous! Hi Stephanie- Sounds like you’ve got a big job ahead of you! 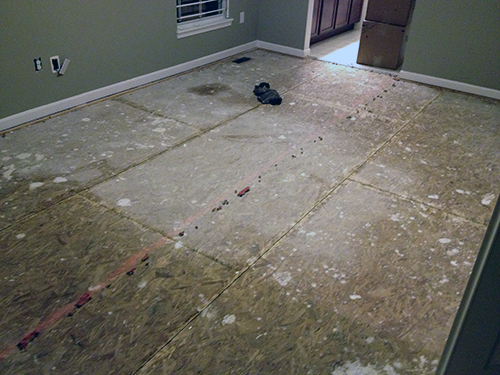 I’m not sure how necessary laying another 1/4″ of plywood over the existing subfloor is. Keep in mind though it’s hard for me to know one way or the other without seeing what’s going on in your room-so do what you think is best! 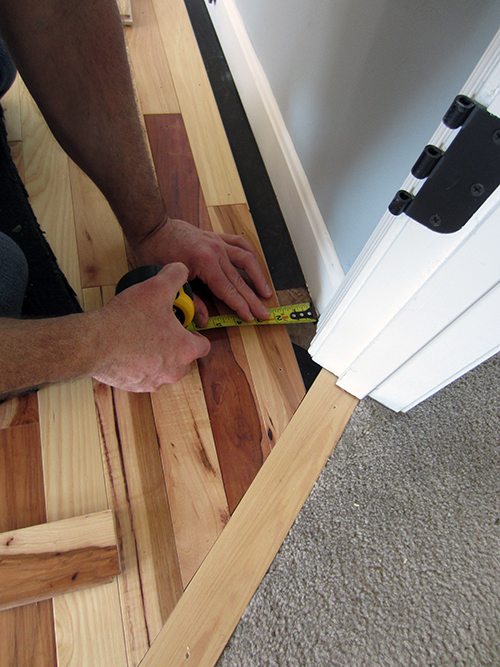 Regarding the trim: In this particular instance the trim around the door wasn’t even after we removed some of it with the jobmax tool, so we had to cut make a tricky cut in the hardwood to let it both fit under the trim AND accommodate for any expansion. That’s all that was. 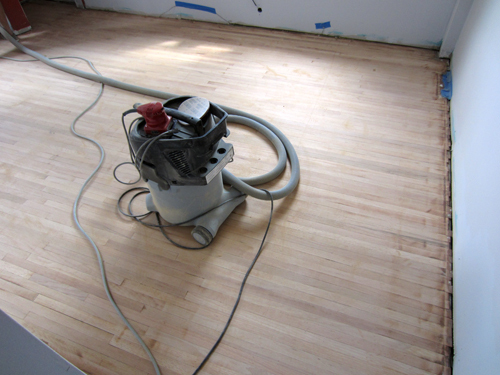 My recommendation before laying anything down is to get the current floor as level as possible through sanding and screwing. 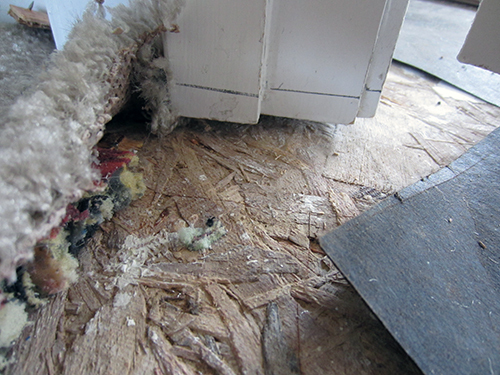 Once you’ve exhausted those options, go for the shingles and roofing felt to get yourself within 3/8″. With the amazing walnut you’re about to lay down, you want to iron out any problems before you’re past the point of no return! I hope that helps! 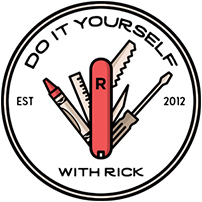 Again it’s hard to give advice without really seeing what’s going on, so use your best DIY’r judgement! Good luck and thanks for the kind words! Loved reading this. You are so funny. I agree-give Rick his own show! I’d watch it.